Nerdy Football Analysis: Charles has repeatedly stated he is healthy, but the Broncos are making sure they are giving him as much time as possible to show them what he can do. HC Vance Joseph promised Charles will play “a lot” against the Packers. As much as box scores lie in the preseason, Charles’ statistical contributions this weekend figure to be a pretty good indicator as to whether or not he will make the team. Nerdy Football Analysis: The cause of the injury is unknown at this time. Jamaal Charles has been cleared for camp but he’s expected to be brought along slowly during August. Rookie De’Angelo Henderson is currently next on the depth chart but if the Broncos believe Booker’s injury lingers into the season, the could go after a free agent (Rashad Jennings, DeAngelo Williams) for depth. 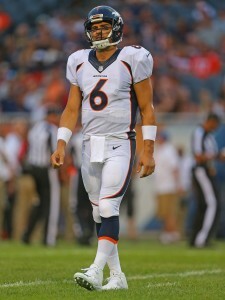 Mark Sanchez Not A Lock For Broncos’ Roster? Broncos head coach Gary Kubiak announced that Trevor Siemian will start the club’s third preseason game against the Rams, and that decision could have implications for veteran quarterback Mark Sanchez, as Mike Klis of 9NEWS writes. First-round rookie Paxton Lynch could leap Sanchez to become Denver’s backup signal-caller, and if that happens, Sanchez may not have a spot on the roster, Klis suggests. Sanchez, whom the Broncos acquired from the Eagles earlier this year in exchange for a conditional seventh-round pick, has completed 66% of his passes during the preseason but struggled otherwise, as he’s tossed an interception, lost two fumbles, and been sacked three times. Siemian hasn’t been great either (17-of-23 for 163 yards and a pick-six), but if the competition is considered close between him and Sanchez, salaries could come into play. As a former seventh-round pick, Siemian is only due to earn a minimum salary during the upcoming, but Sanchez is scheduled to earn $4.5MM, $1MM of which is guaranteed. Sanchez can also earn another $3MM through incentives, but the Broncos could clear $3.5MM off their books by releasing him before the start of the season. If Sanchez is going to be the No. 2 quarterback, his salary is manageable — but if he falls to No. 3, there’s a decent chance Denver isn’t willing to pay the price to keep him around.